1. Pre heat the oven to 200°C/400°F/gas mark 6. 2. Heat a large non-stick frying pan over a medium heat, add 1 tablespoon of the oil and sear the chicken thighs for 1 minute both sides. Remove from pan and set aside. 3. Put all the remaining ingredients in a 3.5 litre casserole dish and stir well to combine. Place the sealed chicken thighs on top, put the lid on the casserole dish and cook in the oven for 30 mintues. 4. 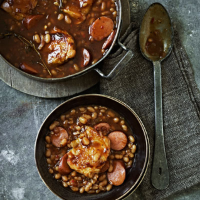 Remove the chicken, stir the bean and sausage mixture and replace the chicken on top. Cook, uncovered, for a further 10 minutes. Leave to stand for 5 minutes off the heat before serving.